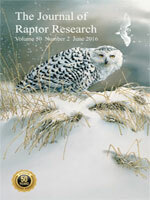 In 1993 and 1995, we detailed body mass growth rates, plumage development, and related behaviors of Snowy Owl (Bubo scandiacus) nestlings from Barrow, Alaska. We recorded data from 71 of 80 nestlings from 14 of 20 nests in 1993 and 154 of 161 nestlings from 33 of 54 nests in 1995. Only nestlings for which we had data from hatching to at least 25 d of age were included in the growth model. Nestlings hatched between 1–3 d after “pipping” (creating a hole in) the eggshell. The semi-altricial young were covered in white protoptile (first) down plumage at hatching and weighed about 44–45 g. For about the first 7 d, their eyes were closed and movement was limited; the nestlings were dependent on the female for thermoregulation, food, and protection. Growth was rapid and by 8–9 d, the dark gray mesoptile (second) down had begun replacing protoptile down. By about 9–11 d, eyes were open, and by about 14 d, the owls were dark gray in color, and primary flight feather quills emerged. Mass gains were greatest the week prior to pre-fledging nest departure. The owls gained about 56 g every d, between 16–22 d. Around 21 d, the primary flight feathers erupted from their quills, and at approximately 25 d, tail (rectrices) feather quills erupted. After pre-fledging nest departure at approximately 21 d, the young owls roamed the tundra on foot and were fed and protected by both parents. We did not observe voluntary brood reduction; however, some young died in nests. Mass growth slowed substantially by about 34 d, while plumage development, particularly flight feather growth, increased rapidly. Young within and between nests, and years, grew at similar rates. Around 36–43 d, the young began their first attempts at flying, by hopping and pumping their wings. Also at this age, differences in plumage between presumed males and females were noticeable. Between 44 and 55 d, the young fledged, coinciding with the time when primary flight feather P8 reached 16.5 cm, and tail feather T1 reached 11.0 cm. The Golden Eagle (Aquila chrysaetos) in Fennoscandia has a widespread breeding range. In Norway, it spans from 58° in the south to 71° north in Finnmark County, making it likely the northernmost breeding population of this species in the world. To gain knowledge about their dispersal and movement behavior, we tagged 25 nestling Golden Eagles in Finnmark with satellite transmitters at the age of 7–11 wk during 2002–2011. About half of the birds made preliminary dispersals of more than 10 km from the nest, before dispersing permanently. The median date of permanent dispersal was 21 October. The main dispersal direction was southerly into the forested and agricultural areas in Sweden, but some birds also moved to Finland, Russia, and the Norwegian coast. The maximum dispersal distance from the natal area was ca. 1500 km. There was a return movement in the spring, with movement rates of about 20–30 km/day. The pattern of southerly migration in the autumn and northerly return in the spring was repeated over consecutive years. The overall survival rate was estimated at 58% during the first year of life, and 50% were alive after 2 yr. However, the birds that were hatched in the interior had higher survival rates than those hatched on the northernmost outer islands, and they also dispersed earlier than those from the coast. Illegal killing of Golden Eagles in northern Sweden was cause of mortality. We examined encounter records from 1925 to 2015 for Red-tailed Hawks banded in the northeastern U.S.A. (n = 1002) and characterized movement patterns by evaluating straight-line distances, difference in latitude, and directionality between banding and encounter locations. We define “encounter” as any handling of a live banded bird, any recovery (a banded bird found dead), and any resighting (reading and reporting a band number on a live bird without actually handling the bird). The mean direction of all hawk encounters was to the southwest of banding locations but some hawks ranged widely; encounters occurred in 27 states, including some in the Mississippi flyway, and in four Canadian provinces. Hawks banded as nestlings or as hatch-year birds (younger) were encountered at farther distances and across a wider range of latitudes than hawks banded as after-hatch-year (AHY) or after-second-year (ASY; older). Most encounters were of younger hawks. In mid-century, most known mortalities were due to shooting; more recent mortalities were due to collisions with vehicles, buildings, or other objects. Some young hawks apparently dispersed out of their natal areas or began migration by three mo post-fledging, and hawks hatched in the Northeast apparently do not migrate north during their first summer. Hawks banded at higher latitudes were encountered at locations farther south than hawks banded at lower latitudes, substantiating leapfrog migration in this species. Encounter data suggested philopatric tendencies; hawks banded as nestlings and encountered at >46 mo of age were encountered significantly closer to their natal areas than hawks banded as nestlings and encountered <46 mo after banding, and more than 10% of hawks banded as ASY or AHY were encountered after several years in the same 10-minute block in which they were banded. Hawks banded as nestlings and encountered at age >46 mo and >250 km from their natal area were considered long-distance dispersers. Between 1930 and 2010, for all hawks banded during the breeding season or summer and encountered in autumn or winter, the difference between banding latitude and encounter latitude decreased by about 4°, suggesting migratory short-stopping. The Chinese Sparrowhawk (Accipiter soloensis) is a little-known raptor distributed in southeast Asia. We here report a 5 yr study on its breeding biology at Dongzhai National Nature Reserve in Henan Province, central China. We banded 270 individuals (84 adults, 186 fledglings), recorded nest tree characteristics, and monitored nests with 24-hr digital cameras, video cameras, and ground observations from blinds. Among the 133 nests found, 91.7% were built on broad-leaved trees. Among 47 nests with known nest initiation dates, 57.4% were in mid-May. The most commonly used trees for nesting were chestnut (Castanea mollissima; 59.4%) and Chinese wingnut (Pterocarya stenoptera; 19.5%). Egg-laying occurred from 17 May to 17 June, with the largest number between 31 May and 4 June (n = 45, 28.9%). Eggs were laid throughout the day and also at night. Mean clutch size was 3.16 ± 0.75 eggs, with no significant interannual variation. Females contributed 87.4% of the total incubation effort. The incubation period was 28 ± 2 d (range 24–31 d, n = 46), and the nestlings fledged in 20.4 ± 1.6 d (range 18–25, n = 27). Overall breeding success was 58.7%, with no significant interannual variation. The daily nest survival rate was 0.993 ± 0.002 during incubation period, and 0.981 ± 0.003 during nestling period. Predation of eggs and nestlings by snakes and Eurasian Jays (Garrulus glandarius) was the main cause of nest failure. Large numbers of Western Burrowing Owls (Athene cunicularia hypugaea) nest in black-tailed prairie dog (Cynomys ludovicianus) colonies in the southern high plains of Texas. Because the Western Burrowing Owl is a species of concern with an uncertain future due to widespread extirpation of prairie dogs, we examined the roles of prairie dog colony size, burrow density, proxies of prey availability, and vegetative composition and structure on owl abundance and reproductive rate. The number of nesting Burrowing Owl pairs was positively correlated to colony area (r2 = 0.550, P = 0.006) and to number of prairie dog burrows in a colony (r2 = 0.733, P = 0.0230). Burrowing Owl numbers and reproductive rate (maximum number of young seen per successful pair) were not related to our measures of vegetative composition and structure in prairie dog colonies, nor to indices of prey availability. Great Gray Owls (Strix nebulosa) in the Sierra Nevada were once believed to nest strictly within mid-elevation conifer forests in close proximity to montane meadows. However, recent observations of Great Gray Owls nesting at lower elevations suggest the lower-montane zone of the Sierra Nevada, where oak-dominated woodlands transition to conifer-dominated forests, may also provide habitat for this California-listed endangered species. We describe the reproductive success, apparent occupancy rate, and habitat associated with eight Great Gray Owl nests monitored between 2006–2014 on commercial timberlands in the lower-montane zone of the central Sierra Nevada, California. Reproductive success was high, with several breeding attempts producing three fledglings, and an average of 1.9 ± 0.9 young fledged during 21 breeding attempts. Apparent occupancy rates were also high (87.5% ± 20.9%) in the years following the discovery of a territory. Nests were in large-diameter (x¯ = 102.5 cm) trees, but smaller-diameter (25.4–50.7 cm) trees dominated the surrounding landscape, which was composed primarily of dense mixed conifer and hardwood forest interspersed with annual grasslands. Our results suggest that the lower-montane zone of the Sierra Nevada, though at the geographic limit of Great Gray Owl’s elevational range, can provide suitable nesting habitat. We used Maxent to identify potential Great Gray Owl nesting habitat throughout the lower-montane zone of the Sierra Nevada based on conditions around the nests we studied. Our model identified areas within 10 counties of the central and northern Sierra Nevada that we recommend be surveyed for Great Gray Owls. Identifying such locations could focus survey efforts to determine if this cryptic species is nesting in the identified areas, perhaps in numbers that may be a significant component of the very small statewide population.